This post and the next were written by a student in my Fungi class in Fall 07. We ate some truffled cheese together and I guess she liked it. Perhaps you are facing a mid-life crisis. Maybe your current occupation is dismally unfulfilling. Or mayhap you are a soon-to-be graduate of a local university and have no post-graduation plans, much to your parents’ dismay. Regardless of your age, if you are dissatisfied with your current position in life, you might consider a career as a truffle farmer. What is a truffle-farmer? and, Why would you ever want to be one? These are questions you will doubtless be asked by inquisitive friends and concerned family members, once you announce your decision to farm truffles for a living. In order to quiet their fears and prove that your fascination with these fungi is a legitimate motivation for a career change, you will need a little bit of background information. First, you will probably need to explain what truffles are, in the mycological sense. After establishing the fact that you are not pursuing a career in chocolate-making, you explain that truffles are the fruiting bodies of a particular group of fungi in the phylum Ascomycota. The order Pezizales, which also includes delicious morel mushrooms, houses the family Tuberaceae, itself home to a range of truffle species (3,4). You give your family and friends some basic truffle morphology, explaining that these particular fruiting bodies (called ascomata) closely resemble clods of dirt, with their irregular spherical shapes and dark, often bumpy exteriors. You mention that the interior of truffles consists of densely-packed reproductive tissue, with white “veins” throughout, and studded with beautiful ascospores. You share some truffle trivia, stating that, unlike most ascomycetes, these fungi do not actively release their spores, and grow hypogeously (under the ground) (3,4). You show them a photo of a freshly harvested black truffle, and a cross-section revealing the dense, marbled interior. When you are further questioned about your affinity for these fungi, you point to their long culinary lineage, noting that truffles were regarded as delicacies by the ancient Greeks and Romans, and that their culinary worth persists to the present day (4). You affirm their economic value by stating that truffles are often sold for hundreds or even thousands of dollars per pound. You assert the ecological benefits of these fungi, describing how they live in mycorrhizal association with the roots of several tree species, particularly oaks and hazelnuts, providing more surface area for nutrient uptake by the tree roots (5). After laying down a convincing argument for the legitimacy of your career path, you decide to put words to action. You realize, however, that there are a number of things to consider before you can launch your career as a truffle-farmer. While there are many varieties of truffles used for both cooking and canning, including the Italian white truffle, the Chinese truffle, and even the desert truffle of the Middle East, you disregard them all in favor of the titan of truffles, Tuber melanosporum (2,5). 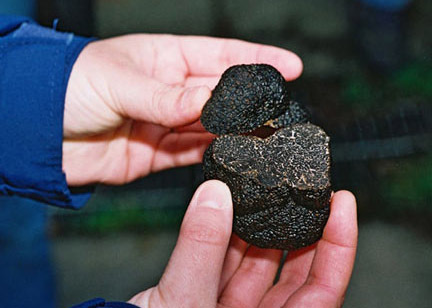 Known commonly as theBlack Périgord truffle for its French place of origin, this esteemed fungus is the most highly prized and economically valuable variety on the market, often selling for over $1000 per pound (6). As T. melanosporum is native to France, you conclude that the best place to begin your career is in the southwest countryside of France, where the distinct seasons and the temperate climate favor truffle growth (2,5). Well-meaning relatives point out that truffle cultivation is not exclusive to France, and suggest you choose someplace else such as the northwestern United States, Italy, New Zealand, China, Australia, Tasmania, or even the Middle East as an alternative (2). You reply that you prefer France, as it is the best place to enjoy truffles of the fungal and chocolate variety. When friends and family point out that they don’t know a lot of truffle-farmers, and suggest that you might be lonely in your new profession, you allay their fears by explaining that you will have a constant companion in your hand-picked truffle-hog. An essential to truffle-farming, the truffle-hog (or truffle-dog, should you prefer canines to swine), would be used during truffle-harvesting season (usually from November to March) (6) to detect the strong, earthy odor of the truffles in the soil. As truffles mature underground, you explain, they emit an odor which attracts pigs, and can be recognized by dogs as well (2,3). After choosing a variety, a region, and a truffling companion, you realize all you are lacking are the truffles. Doing some research, you discover that there are businesses which specialize in the production of trees with roots already inoculated with T. melanosporum (5). You make plans to purchase some trees, but your well-laid plans are almost derailed by an unanticipated bout of sound reasoning. You realize that truffle farms take some years to come into their full glory, as the fungi and the roots must develop and mature before any significant harvesting is possible (5). Refusing to give up on your dream, however, you decide to travel to France and apprentice yourself to an established truffle farmer, to learn the tricks of the trade and establish your trees. You astutely pick up a copy of the new book Taming the Truffle as your bible (7). Then you depart for France, confident in your new life direction, and promise to write family and friends of your experiences in the French truffle industry. Brodie, Harold J. Fungi: Delight of Curiosity. University of Toronto Press. Toronto, Canada. 1978. Freedman, Louise. Wild About Mushrooms: the Mycological Society of San Francisco Cookbook. The Mycological Society of San Francisco, 2000. Published online: http://www.mykoweb.com/cookbook/index.html Accessed 11/1/07. Kendrick, W.B. The Fifth Kingdom. 3rd Edition. Mycologue Publishing. Moore-Landecker, E. The Fundamentals of the Fungi. Prentice-Hall Inc., Edgewood Cliffs, N.J. 1972. Hall, Ian R,, Gordon T. Brown, and Alessandra Zambonelli. 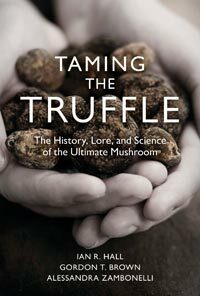 Taming the Truffle: The History, Lore, and Science of the Ultimate Mushroom. Timber Press. 2008. 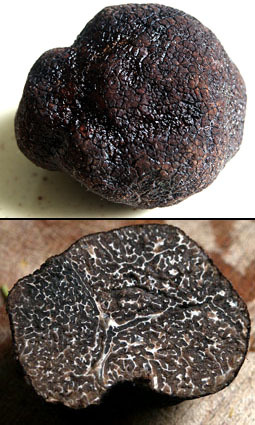 Public domain images courtesy of Wikimedia Commons: A fresh, whole truffle, and a truffle in cross-section. Editor’s note: Just a couple of months ago truffles hit a new high: an Italian white truffle weighing 3.3 lbs (that’s insanely big) sold for about $330,000! More Editorial ranting: You should buy this book, Taming the Truffle, you know. It is pretty amazingly thoughtful and comprehensive and will surely become dirt-stained and probably also soiled by your truffle pig as you develop your empire. Really. –Kathie. Now that you have been in France for a while, what progress have you made in your quest to become a truffle farmer ?? Perhaps, through the miracle of recombinant DNA, I can realize MY dream — a true CHOCOLATE TRUFFLE!!! I’ve got three innoculated hazelnuts, only five more years before we know. You don’t need the book, (save the money and buy another plant) you just need time.